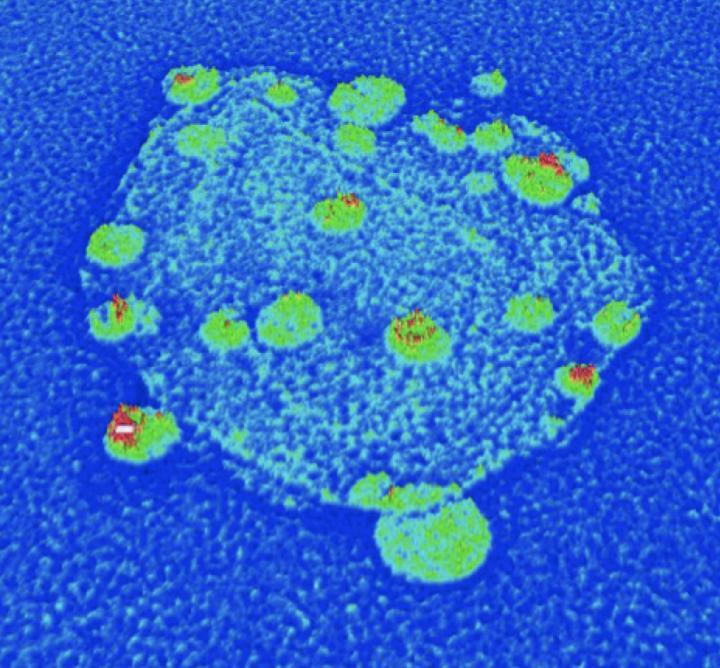 The process begins with tiny, nanoscale diamonds that contain a specific type of impurity: a single nitrogen atom where a carbon atom should be, with an empty space right next to it, resulting from a second missing carbon atom. This "nitrogen vacancy" impurity gives each diamond special optical and electromagnetic properties. By attaching other materials to the diamond grains, such as metal particles or semiconducting materials known as "quantum dots," the researchers can create a variety of customizable hybrid nanoparticles, including nanoscale semiconductors and magnets with precisely tailored properties. "If you pair one of these diamonds with silver or gold nanoparticles, the metal can enhance the nanodiamond's optical properties. If you couple the nanodiamond to a semiconducting quantum dot, the hybrid particle can transfer energy more efficiently," said Min Ouyang, an associate professor of physics at UMD and senior author on the study. While such applications hold promise for the future, Ouyang and colleagues' main breakthrough is their method for constructing the hybrid nanoparticles. Although other researchers have paired nanodiamonds with complementary nanoparticles, such efforts relied on relatively imprecise methods, such as manually installing the diamonds and particles next to each other onto a larger surface one by one. These methods are costly, time consuming and introduce a host of complications, the researchers say. The method developed by Ouyang and his colleagues, UMD physics research associate Jianxiao Gong and physics graduate student Nathaniel Steinsultz, also enables precise control of the particles' properties, such as the composition and total number of non-diamond particles. The hybrid nanoparticles could speed the design of room-temperature qubits for quantum computers, brighter dyes for biomedical imaging, and highly sensitive magnetic and temperature sensors, to name a few examples. The special properties of the nanodiamonds are determined by their nitrogen-vacancies, which cause defects in the diamond's crystal structure. Pure diamonds consist of an orderly lattice of carbon atoms and are completely transparent. However, pure diamonds are quite rare in natural diamond deposits; most have defects resulting from non-carbon impurities such as nitrogen, boron and phosphorus. Such defects create the subtle and desirable color variations seen in gemstone diamonds. The research paper, "Nanodiamond-Based Nanostructures for Coupling Nitrogen-Vacancy Centers to Metal Nanoparticles and Semiconductor Quantum Dots," Jianxiao Gong, Nathaniel Steinsultz and Min Ouyang, was published in the journal Nature Communications on June 8, 2016. This work was supported by the United States Department of Energy (Award No. DESC0010833), the Office of Naval Research (Award No. N000141410328) and the National Science Foundation (DMR1307800). The content of this article does not necessarily reflect the views of these organizations.